The dockyard where Nelson's flagship was built is hosting a festival as part of the celebrations of the 200th anniversary of the Battle of Trafalgar. 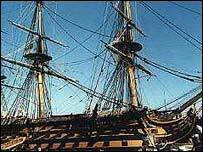 HMS Victory was built in Chatham, Kent, between 1759 and 1765. The Historic Dockyard Chatham is staging a two-day maritime festival on Sunday and Monday. Among the attractions are trips on the River Medway, a sponsored mast climb and the chance to look round a visiting tall ship called the Lord Nelson. The Lord Nelson is the only purpose-built tall ship in the world modified to allow people with disabilities to join the crew. Chatham will also be hosting a series of events at the time of the Battle of Trafalgar's actual anniversary in October. Trafalgar Day itself, 21 October, will bring a Trafalgar Night party and firework display, while the dockyard will also be home to a Nelson exhibition on loan from the National Maritime Museum. Earlier this year Number Two Dock at the dockyard - in the same spot as the one used for the building of HMS Victory - was renamed Victory Dock to mark its place in history.